As a sports nutritionist, I work with athletes and every people to help them achieve their goals of health, faster, leaner, less body fat and less fatigue along with better recovery. The common link with my clients is they are willing to make a change (at least initially) but fall back into older well formed habits of eating and taking care of everyone else but themselves. When we try to help ourselves first, we can then be able to help others later (kind of like the inflight recording about your oxygen mask…..put yours on first, then help your children and others near you). One way to take care of yourself is to take in better nutrition. This will help in many aspects of life, including everyday office tasks, learning, and athletic performance. Junk in, and well, you really should not expect stellar results. To help you with your daily and athletic performance, we have to look at the fuel you use. I am going to paraphrase a bit from the post at sportechservicesinc.com where they use the analogy that our bodies are high performance vehicles. We are designed to be using high quality fuels (foods free of toxins, preservatives, artificial sweeteners, processed additives and hydrogenated fats). We are not designed to work at high performance levels using low grade fuels (low grade fuels include processed foods those that look like real food, but are not real). Over time, your high performance engine will get ‘gunked’ up with the additives, toxins and impurities. Your engine will be sluggish, recover poorly, concentrate poorly with slower reaction time and most of all, not be able to exert a lot of energy for a prolonged period of time! When we eat junky quality food, we probably are not thinking of it as performance fuel. We just throw it in and hope it works well enough – it was less expensive and convenient! Over time, we spend more energy fighting the toxins and junk from this poor quality food that we have little left over for the actual activity we are about to do, or we get sick because the body has no more defenses left over to fight actual viruses or foreign invader. The body (engine) spent all its energy on digesting and trying to eliminate the toxins from the food we eat! So what are you to do? Well, just like with your car, don’t switch from low-grade to high-grade overnight! This can cause your body to react with releasing those toxins so fast, you think you have the flu and decide healthy eating is not for me. As athletes, these toxins are released as you lose body fat, too. Fat cells are where your body stores toxins – and in the liver. As you start to burn fat in training, those toxins are released into the blood stream and can cause short-circuitry in your daily performance. Yeah, sign me up! Maybe not what you expected, but your performance will suffer if you keep putting in the junk. You can definitely start with a detox plan, but choose one that uses more real foods, and eases you into healthy naturally but no necessarily overnight. I just finished the Detox Plan For Athletes which allows you to continue training while you ‘clean up your fuel’. It includes more vegan proteins and some animal proteins, but only high quality wild meats -not farm raised (unless it is your local farmer!) which are needed for recovery. It includes root vegetables as a carbohydrate source, but also allows for non-wheat grains, too in your post-workout recovery meals. There are plenty of healthy fats, too but most importantly, it is a transition into healthier eating with menu plans, 40+ recipes and more. I have not seen a program like this which is why I chose to create it! Much easier than the ‘hard-core’ 2 Week Detox Plan I offer, but more to gain from than the Mini Detox Plan (great for a week or less!). Choose the one that suits you the best! As athletes, we always strive for performance gains….changing your nutrition is a big part of that gain (energy, strength and stamina not weight!). Make 2013 the year YOU choose performance as your healthy focus and use real food as your performance fuel! If you find recipes or detox plans I should review, please feel free to share them with me! Or reach out for questions about performance nutrition at www.n-im.net or on Facebook Nutrition In Motion. 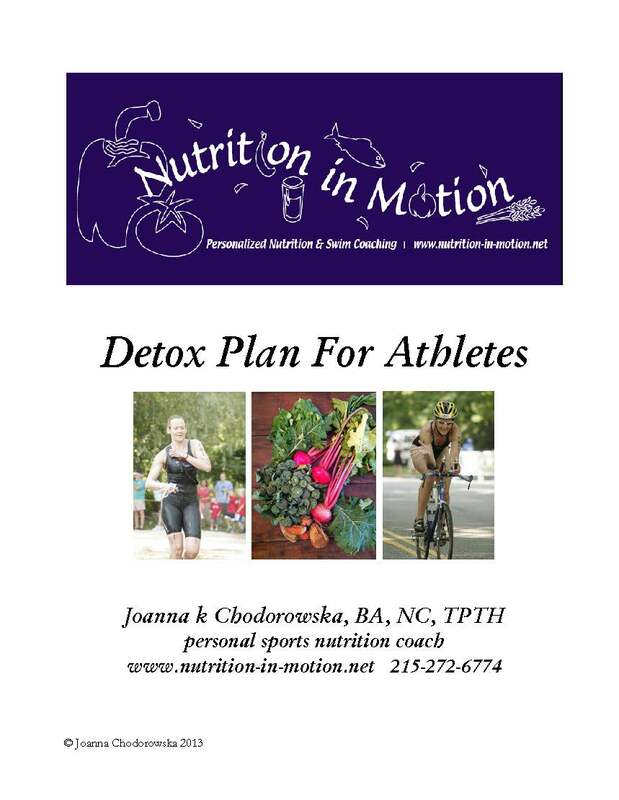 Joanna Chodorowska, BA, NC, TPTH, METS is the founder of Nutrition In Motion, LLC specializing in sports nutrition for the endurance athlete using real foods for real performance results. Find inner peace and balance physically, emotionally, mentally and spiritually to gain outer courage, strength and brilliance. this topic. You know a whole lot its almost hard to argue with you (not that I personally will need to…HaHa).